Arabu is the cross country skier's dream with a nearly unlimited system of tracks in a terrain that was made for the sport at his disposal. The alpine skier has a short way to go to Rauland where there are lifts, ski schools, ski rental and a number of exciting pistes. You will find Arabu at the southern tip of the Hardangervidda high mountain plateau and on the banks of Lake Møsvatn. The lake is one of the many great Telemark waters, abounding in fish and beautiful to the eye, 930 m above sea level. The area has been declared a nature reserve on account of the rich and rare flora and fauna and the untouched scenery. Hardangervidda is Norway's most extensive high mountain plateau with spectacular lakes framed by blue ridges and snow-capped peaks, the perfect environment for an invigorating and refreshing mountain holiday! Arabu is the right place for those who enjoy the rugged life of the mountain, who appreciate the wilderness, the fresh air and the unspoiled nature. 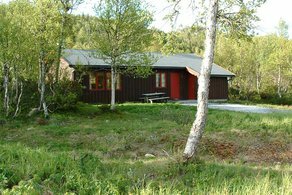 The cottages are 200 m from the banks of Lake Møsvatn and boats may be borrowed for rowing and angling. Fishing cards can be bought. 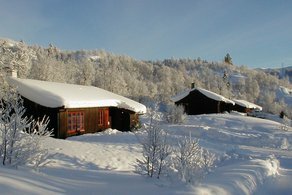 Excursions to nearby Rjukan or Rauland are recommended. There you may enjoy the many sights, climb the Gaustatoppen peak or go horseback riding. From Larvik follow the E 18 to Porsgrunn, then R 36 to Seljord, E 134 to Høydalsmo, turn right to Øyfjell and Rauland from where the R 37 takes you to Arabu. From Kristiansand follow the Setesdal valley (R 12) to Haukeligrend, then R 362 over Arabygdi to Rauland and R 37 to Arabu - or R 39 to Brunkeberg, E 134 to Øyfjell and Rauland and the R 37 to Arabu. From Oslo EI8 to Drammen and R 37 by way of Kongsberg and Rjukan straight to Arabu. 950 m above sea level. 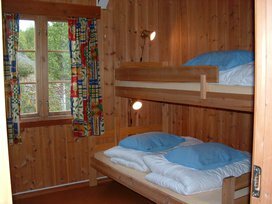 7 cottages, each measuring 72 m2 and consisting of 3 sleeping rooms, two of which with a large bed and an upper bunk and one with a double bed, all together 8 beds; shower, WC and Sauna. Kitchen fully equipped for 8 persons, el. 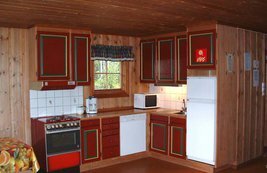 cooker with three plates and an oven, refrigerator with small freezer, coffee machine, dishwasher, TV, Wifi, a 35 m2 sitting room with an open fire, el. heating in all floors in addition to stoves, wood shed.